This week's charts cover the period from March 25th to March 31st. 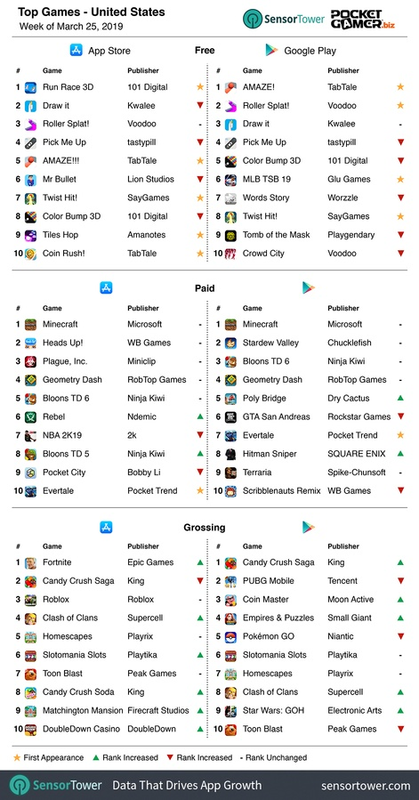 Two new competitors stormed the free US charts this week, with 101 Digital’s Run Race 3D claiming first for the App Store, while TabTale’s Amaze replicated that success on Google Play. Voodoo’s Roller Splat remained steady at third for iOS as well as making its Android debut at second. Twist Hit from SayGames broke into both charts grabbing seventh and eighth respectively. Evertale was the only new title to break into paid installs, finishing at seventh on Google Play and sneaking in at tenth for the App Store. Fortnite and Candy Crash Saga continued to fight it out for the grossing top spot on iOS, with Epic Games’ battle royale reclaiming first from King’s match-three puzzler. Looking now to the free downloads rankings on Android, Voodoo’s Roller Splat swapped places with Tastypill’s Pick Me Up due to the latter dropping to fifth, after snagging first last week. Kwalee’s Draw it on the other hand, stayed solid at first for the App Store while climbing to third on its debut week on Google Play. 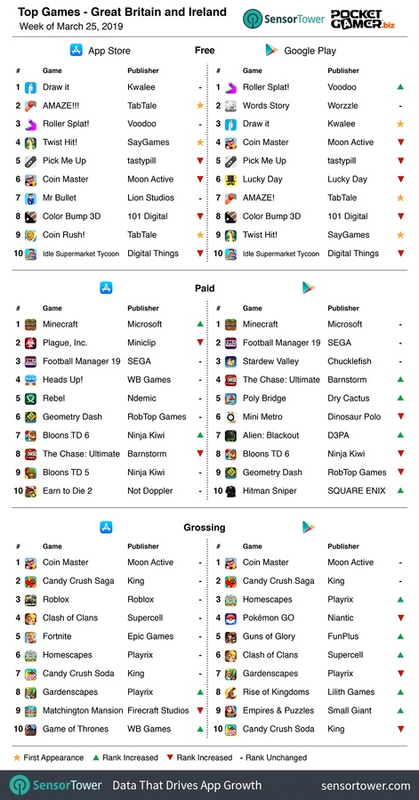 Interestingly, Coin Master has slowly been descending across both free download charts, however, Moon Active’s interactive title has stayed rooted at first across both stores for top grossing. 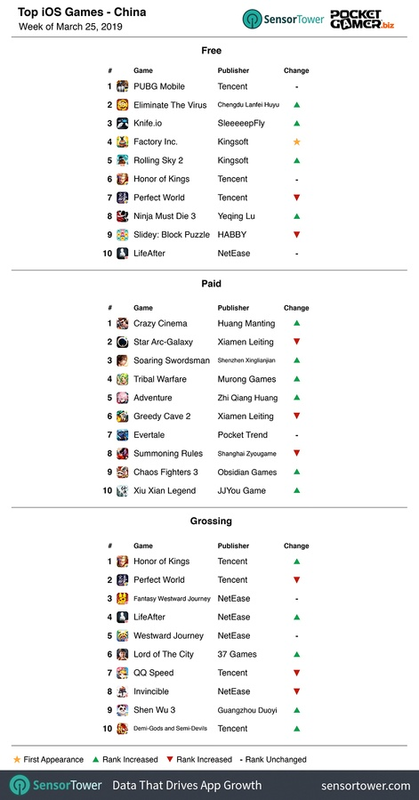 Tencent continued its dominance with Honor of Kings and Perfect World holding strong in first and second position, though the pair have swapped from last week. Paid downloads saw little change, with Huang Manting’s Crazy Cinema wrestling pole position away from Ziamen Leiting’s Star Arc-Galaxy. Kingsoft’s Factory Inc. made its first appearance for free downloads claiming fourth while PUBG Mobile held onto top spot for the second week in a row.